Depending on how long a part or product needs to remain traceable, the relative permanence of various marking methods could be a game-changer. In the aerospace industry, for instance, parts could be in use for as long as 30 years. Direct part marking is crucial for enabling the traceability of products and the parts comprising them throughout their use. Although each method for applying direct part marks (DPMs) has advantages and disadvantages, they all share one key feature: permanence. Even continuous ink jet, which is considered a “semi-permanent” method of applying DPMs, is sufficiently long-lasting to be suitable for many applications. It’s certainly much better than putting a sticker on an item that could rub off easily. Depending on how long a part or product needs to remain traceable, the relative permanence of various marking methods could be a game-changer. In the aerospace industry, for instance, parts could be in use for as long as 30 years. The marking method of choice for aircraft parts is typically dot peening, which is known for its durability. Parts used to make computers, on the other hand, might have an expected lifetime of just a couple years, so other methods that result in faster production or lower costs might be more attractive. Lasers produce extremely focused, narrow light beams that can alter the surface of various materials. They are currently the technology of choice for producing extremely small, high-resolution codes that can fit onto crowded PCBs and delicate surgical instruments. In fact, some of the DPMs marked by lasers are barely visible to the human eye – at least, the individual cells composing them are. As a whole, laser marking is fairly flexible, meaning that it can work on many different substrates. However, this leaves out the crucial detail that two main types of laser marking exist, and each only works on certain materials. 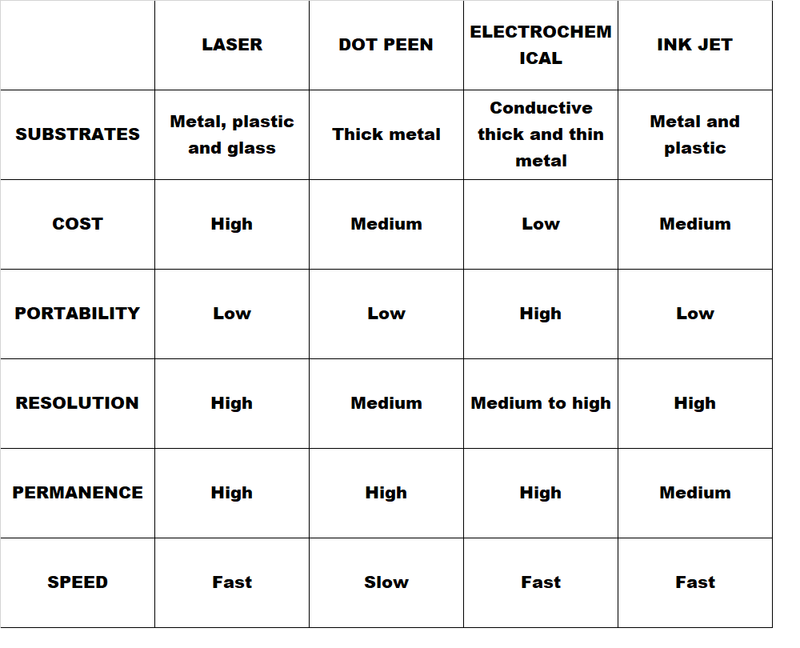 Solid state lasers are used to mark various metals, ceramics and plastics, whereas CO2 lasers are reserved for glass and plastics. Together, they can mark pretty much anything. Since laser marking is quick and sharp, it’s great for high-volume production. The entry cost is high relative to other methods, but maintenance is inexpensive and there are no consumables (such as ink) that would bring the price up over time. One particular advantage for the medical industry is that the resulting DPMs don’t have grooves, so there are no footholds for bacterial growth. To create a dot peen mark, a specialized stylus hammers a dotted pattern into the surface of a part. It’s great for marking stainless steel parts in the aerospace and automotive industries because the resulting marks can last for decades. 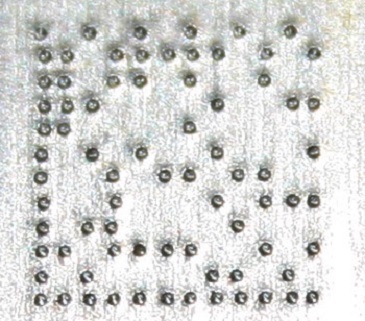 The primary downsides of dot peening are that it takes a long time, doesn’t work on thin metal pieces and lacks the precision of other methods. 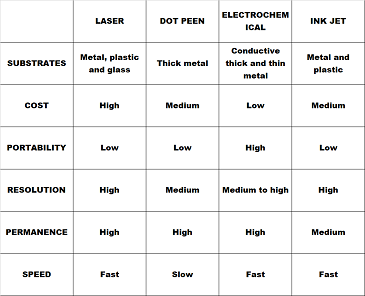 Electrochemical etching uses a low-voltage current to lightly corrode the surface of metal parts through a stencil soaked in an electrolytic fluid. Relative to dot peening, this method is highly precise and can be used on metallic parts of any thickness. 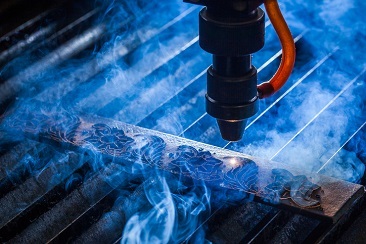 Although the etching equipment is fairly cheap and portable, the method is better for low-volume production because there are multiple steps involved (such as creating a stencil). It also uses consumables in the form of the electrolyte solution. Great for marking parts on the fly, the continuous ink jet method involves spraying small dots of ink directly onto the substrate. Unlike the methods described above, this one is considered to be merely semi-permanent rather than permanent. That said, if a part or product isn’t likely to undergo significant stress during its lifetime, ink jet might be just fine. Depending on the color of the substrate, the marks produced with continuous ink jet can have a high level of contrast and readability. This is advantageous because other methods that produce grooves in the substrate can require specialized lighting arrangements to enhance readability. Another point in favor of ink jet is that its initial cost is low. However, consumables in the form of ink must be replaced throughout its use. Below is a comparison of the most commonly used direct part marking methods. Choosing the ideal marking method can require some experimentation, as every industrial situation presents unique challenges. For this reason, it’s crucial that manufacturers understand what’s most important to them, whether it be speed, durability, low cost or another consideration. Are you already using Direct Part Marks? Consider reading our other DPM related post "The Coevolution of Miniscule Laser Markings and the Trusty Industrial Readers That Decode Them" and watch the webinar about our recently released miniature MicroHAWK ID-45, optimized to read DPM in all sorts of settings including metal cavities. Equipped with the TRUE Autofocus and X-Mode technology, ID-45, can read damaged codes too and is a perfect match for electronics, medical device and any DPM application. Omron Automation is an industrial automation partner that creates, sells and services fully integrated automation solutions that include robotics, sensing, motion, logic, safety, and more. Established in 1933 and currently headed by President Yoshihito Yamada, Omron's 36,000 employees help businesses solve problems with creativity in more than 110 countries. Learn more at omron247.com. Microscan Systems is now a valued part of the Omron family. Handheld barcode scanners are essential whenever specific products, clinical samples or work-in-progress (WIP) parts need to be reliably tracked without the luxury of a fully automated system.